Yes we do enjoy doing crazy things. 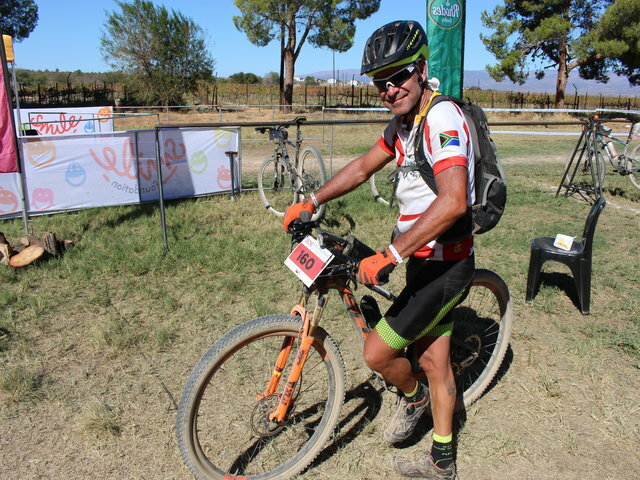 Here the owner during the 36One mountain bike challenge. Picture taken at the 210km mark. Cycle Africa Tours is an owner run and managed tour company based in Cape Town which specialises in bicycle tours throughout the country. Single trail mountain biking, wilderness experiences and road cycling is our forte, all our tours can be offered as a TAILOR MADE package for yourself or group. We too offer cultural tours along the Garden Route and around Cape Town. Being local South Africans we strive to use hand picked accommodations and quaint restaurants and believe the local entrepreneur should benefit and not always the large chains where you our guests are just numbers. Not only does South Africa boast a diversity of cultures, fauna and flora but we at Cycle Africa Tours believe that “Local is lekker” and are proud to show the rest of the world that we can offer a quality experience. 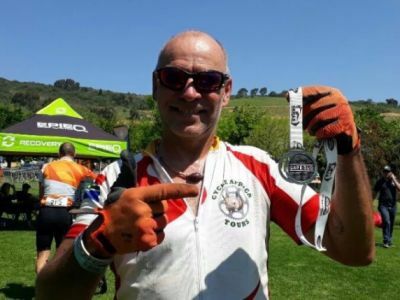 Cycle Africa Tours is owned and run by Steven Brown, a keen outdoors person and registered National Adventure Guide, but also a Cultural Guide. Steve spent many years working in Namibia’s Etosha National Park and later at Lianshulu Lodge in the Caprivi Strip as resident ranger/guide before returning to Cape Town, only to leave the southern hemisphere by sailboat and virtually circumnavigating Africa before heading to Germany. Here he started his cycling, doing long distance trips with a pannier loaded touring bicycle, and learning the language. After eleven years Steve returned home and got straight into bicycle tourism. Because of this extensive outdoor experience, every tour will be planned to the last detail, ensuring his guests the best possible experience. For Steve it is a pleasure to introduce even the most inexperienced cyclist to the wonders of travelling in South Africa whilst seated on a bicycle. Our commitment and enthusiasm for cycling holiday destinations and travel is strong. This is why we are always looking for new routes and areas to cycle in. Whatever your interest, road cycling, mountain biking, small groups or a tailer made trip. We look after all those who travel with us. How often do you see a tour but don't book because you think you can't keep up? Those days are past. Remember, you too have a place with us. PLease feel welcome to contact us should you have and questions.